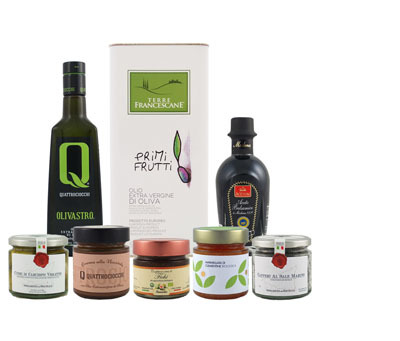 OLIO QUATTROCIOCCHI OLIVASTRO 500ML: This extra virgin olive oil is produced exclusively from 100% Itrana variety olives locally grown on the Quattrociocchi Estate in Alatri. This oil has a fruity aroma enhanced by complex notes of grass, artichoke, green tomato and apple. Its flavor is pleasantly balanced in bitter and spiciness with hints of green almond. TERRE FRANCESCANE PRIMI FRUTTI 5L TIN: The perfect extra virgin olive oil for everyday use in the kitchen – from light sautéing to roasting to dressing. This medium fruity oil is sure to find a broad array of uses in your kitchen. TENUTE LIBRANDI ORGANIC CLEMENTINE MARMALADE: A delicious citrus marmalade made from organic clementines grown on the estate of Tenute Librandi. The jam is made in small batches during the citrus harvest with organic brown sugar and a touch of lemon juice. IANNOTTA ORGANIC FIG JAM: A rustic fruit jam harvested from organic fig trees in Lazio, Italy by Lucia Iannotta. Excellent served on toasts, pastries, goats cheese, hors d'oeuvres and more. *FRANTOI CUTRERA VIOLETTO ARTICHOKE HEARTS: Sicilian artichoke hearts from the local Violetto variety in Frantoio Cutrera’s Gran Cru Biancolilla extra virgin olive oil combined with vinegar, mint, Sicilian red garlic, chili and Sicilian sea salt. Great for starters, bruschetta and sandwiches. *FRANTOI CUTRERA SEA SALT CAPERS: These highly prized Sicilian sea salt capers are carefully cultivated on the island of Pantelleria off the southwestern coast of Sicily. Excellent when added to pasta sauces, meat dishes and fish. **Without gluten. May contain traces of milk or lactose proteins. Contains hazelnuts, traces of other nuts and peanuts.